Ideally, everybody in an organization can run the same version of Tableau Desktop or Tableau Server, but that's not always possible. In a large organization, different individuals or groups might need to use different versions of Tableau products. This article describes compatibility considerations and how Tableau Desktop and Tableau Server can work together. Note: This article discusses only Tableau products that are still eligible for technical support. Tableau provides technical support on each version of the product for 30 months after release. For a list of versions and their support schedules, see the Support Services page on the Tableau website. Compatibility issues typically arise only between release versions of Tableau products. 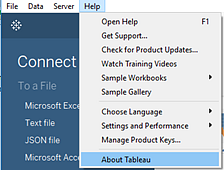 For example, if you are using Tableau Desktop 2019.1 and others are using Tableau Desktop 2018.3 or if you need to publish to Tableau Server and it is still running version 2018.1, you can encounter compatibility issues. To identify which version of the product you are using, with Tableau Desktop open, select Help >About Tableau from the top menu. The About Tableau dialog opens and the version number is displayed at the top of the dialog. The version number includes the release number and any maintenance release version number if applicable. In this example "2018.1" = the release version and ".4" = the maintenance release version of the product. Note: Tableau Prep Builder doesn't follow this same naming model for its release numbers. Tableau Prep Builder release versions are numbered like Tableau Desktop maintenance versions, for example 2019.1.1, except Tableau Prep Builder doesn't release maintenance versions of that product. Release versions often include a range of new features and updates. If you try and publish your updated workbook to a prior version of Tableau Server, where those features aren't available, the workbook becomes incompatible. There are no compatibility issues with maintenance (or dot) release versions—for example, between Tableau Desktop version 2018.3.1 and Tableau Desktop 2018.3.3 or Tableau Desktop 2018.1.3 and Tableau Server version 2018.1.4. There is one exception. Tableau sometimes introduces new connector support with a maintenance release. This can introduce compatibility issues between Tableau Desktop and Tableau Server if Tableau Desktop has been upgraded but Tableau Server hasn't been. For details about data source support by release, see the Release Notes page. A newer version of Tableau Desktop can open a workbook created with an older version. An older version of Tableau Desktop can't open a workbook created with a newer version. If Zachary edits and saves the workbook and sends it back to Amanda, he will need to downgrade the workbook first so that she can open it. If not, the load will fail when Amanda tries to open it in Tableau Desktop version 2018.3, because the workbook is now a 2019.1 workbook. For more information about downgrading your workbook between Tableau Desktop versions, see Downgrade your workbook in this article. The same logic applies to Tableau extracts. A newer version of Tableau Desktop can open an extract created with an older version but an older version of Tableau Desktop can't open an extract created with a newer version. However if you create a .tde extract in an older version and open the workbook in Tableau Desktop 10.5 and later and refresh (full or incremental) or append to the extract, it will be converted to the .hyper format and the workbook will become incompatible with older versions of Tableau. If you know you will be sharing your workbooks with users that have Tableau Desktop version 10.5 or later, save a copy of your workbook first before sharing it. If the workbook has already been opened in version 10.5 or later, you can downgrade the workbook to an earlier version if the extract hasn't been refreshed or appended to already. For more information about the .hyper extract format, see Extract Upgrade to .hyper Format. For more information about how to downgrade your workbooks to prior versions, see Downgrade your workbook in this article. A workbook created with any version of Tableau Desktop can connect to any supported version of Tableau Server. But once you are connected, compatibility can be an issue depending on the version you are using and the action you're performing. You can publish workbooks and data sources to Tableau Server if the version of Tableau Server is the same or newer than the version of Tableau Desktop. For example, you can publish workbooks and data sources from Tableau Desktop 2018.1 to Tableau Server 2018.1, Tableau Server 2018.2, or Tableau Server 2018.3. But if Tableau Server is running an earlier versions than Tableau Desktop, you will be prompted to downgrade the workbook before you can publish it to Tableau Server. For example, you can downgrade a workbook created on Tableau Desktop version 2018.2 to publish it to Tableau Server version 10.5. For more information about how to downgrade your workbook, see Downgrade your workbook in this article. Important: If your workbook contains an extract using the .hyper format or if you are running Tableau Server version 10.1 and earlier, the downgrade workbook features are not available. A workbook downloaded from Tableau Server has the same version as the version of Tableau where it was last edited. For example, suppose Amanda is running Tableau Desktop 2018.2 and publishes a workbook to Tableau Server 2018.3. If Zachary is also running Tableau Desktop 2018.2, he can connect to Tableau Server, download the workbook, and open it. If someone else edits and saves the workbook on the server, the workbook is updated to that version of Tableau Server. If someone downloads the workbook from Tableau Server to a newer version of Tableau Desktop and edits, saves, and publishes it, the workbook is updated to the newer version of Tableau Desktop. For example, suppose Elizabeth publishes a workbook from Tableau Desktop 2018.2 to Tableau Server 2018.3. Ted downloads the workbook from Tableau Server to Tableau Desktop 2018.3. He edits and republishes the workbook back to the server. The workbook is now updated to the newer version. Zachary and Elizabeth, who are both using Tableau Desktop 2018.2 can download the workbook but can't open it because the workbook has been updated to Tableau version 2018.3. If using Tableau Server version 10.5 and later, published extracts that were created using Tableau Desktop 10.4 and earlier (that is, the extract uses a .tde file format) are automatically upgraded to the .hyper format when they are refreshed (full or incremental) or appended to. If this happens, the workbook can no longer be opened using previous versions of Tableau Desktop. For more information about the .hyper extract format, see Extract Upgrade to .hyper Format. For previous versions of Tableau Server, any published workbook or data source with an extract created in Tableau Desktop retains its original version when it's refreshed or appended to on Tableau Server. Workbooks in Tableau Desktop can use data sources that have been published to later versions of Tableau Server. However, if you connect to a data source that uses features that aren't in that earlier version of Tableau Desktop, those fields are unavailable. 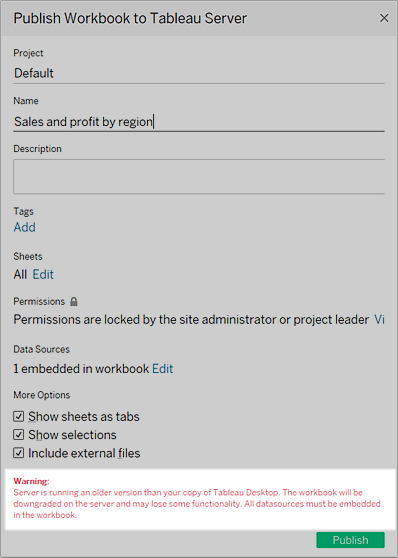 For example, suppose you create a workbook in version 8.3 of Tableau Desktop, and then connect to a data source on Tableau Server version 9.0 that contains fields that include level of detail expressions. In that case, those data fields are unavailable in the Tableau Desktop 8.3 workbook, because level of detail expressions were not available until Tableau 9.0. Workbooks created in Tableau Desktop can always use data sources from an earlier version of Tableau Server. For example, a Tableau Desktop 2018.3 workbook can use data sources from Tableau Server 10.5. Note: These features are not available for workbooks that include a .tde extract that has been refreshed (full or incremental) or appended to in version 10.5. The extract will have been converted to use the new .hyper format and this format can't be downgraded back to a .tde format. For more information about the .hyper extract format, see Extract Upgrade to .hyper Format. You can export your workbook to a different version of Tableau using File > Export As Version in Tableau Desktop, or select Download > Tableau Workbook in the toolbar of a workbook in Tableau Online or Tableau Server. For more information, see Export Views and Workbooks. If you are using a newer version of Tableau Desktop and an older version of Tableau Server, you can downgrade the workbook to the older Tableau Server version during publishing. When you publish the workbook, you will see a warning message that tells you that the workbook will be downgraded. If you continue to publish the workbook, any features or functionality that aren't available in the older version are removed for compatibility. If you open the downgraded workbook in the newer version of Tableau Desktop, you will see a message like the one shown below. You may need to add back the features that were removed when the workbook was downgraded. Note: This option doesn't apply to data sources.